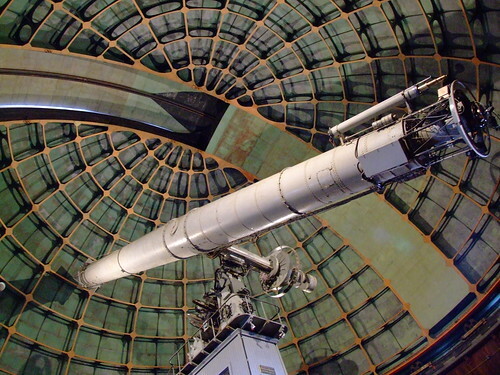 Inside one of the many domes of the Lick Observatory, on the top of Mount Hamilton near San Jose, the 36" refractor telescope waits for dark. For the first time, SKY-MAP.ORG was able to present the famous Hubble Ultra Deep Field on the Internet using a visual form, convenient for browsing on a regular monitor screen. The SKY-MAP.ORG technology makes it possible to view this image at any scale. Furthermore, all objects from the UDF directory (10,000 galaxies) on SKY-MAP.ORG are identified. By pointing the mouse at any object, a user causes a browsing window to open. This window will contain brief information about the object. A mouse click on the object opens a window with detailed information and new articles about this object. The unique SKY-MAP.ORG technology can conveniently display any images, including enormous photographs of very high resolution. To view these images and photographs is often very difficult because of a computer’s limited capacity. Moreover, SKY-MAP.ORG allows, with ease, to combine multiple images into one. This amazing technology is a powerful tool, which makes it possible for the general public to easily manipulate data, which earlier could be accessible only by a limited circle of professionals due to technical reasons.